...Journeying Up the Mountain of God: "R U Hard or Soft Clay?" 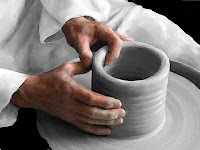 “As the clay is in the potter’s hand, so are you in My hand.” (Jeremiah 18:6b, NLT) If you have ever seen a skilled potter at work, you know they create beautiful works of art with what seems to many others to be just simple clumps of clay. The potter looks beyond what most of us “see” in the clay to that which he imagines “can truly be!” Isn’t that what God’s Word teaches us about how our Lord sees us – His living works of art. 1 Samuels 16:7 decries, “God does not see the same way people see. People look at the outside of a person, but the Lord looks at the heart (i.e. He sees the ‘divine potential’ of the soul which He lovingly places into each of us at the moment we are conceived).” (NCV) God often shares some of that divine insight with those of us who He has called to shepherd the souls of His spiritual flock (believers, His Church) so that we can better help fellow clay vessels in their journey to becoming fine works of Kingdom art. Over the years of ministry, I have come to understand more of the use of the potter imagery spoken of by Jeremiah. I realize that every human being is a unique vessel which is hand-crafted in the Great Potter’s own hands and each work of His creation is divinely imprinted with our Creators’ own image – “God created human beings in His own image. In the image of God He created them; male and female He created them.” (Genesis 1:27, NLT) That divine imprint of our Creator affirms our great worth / value given to us by the very One who fashioned us (Isaiah 64:8). Yet many choose to dismiss or disregard this eternal truth, and as a result become clay that is dry, stiff and devoid of moisture (water; ‘unrepentant clay’) – a self-made condition that renders us unusable in the Potters hands. We must understand that our Potter’s grand design depends on the malleability (i.e. moldability) of His clay. If we choose to allow Him to moisten us through His use of “living waters” (John 4:10) poured across and worked deeply into our lives through His Word (Ephesians 5:26), then we will become soft, pliable (malleable) clay which is ready for His divine shaping into the work of art which He has destined us to become! This morning, I would challenge you to reflect on your own spiritual malleability – are you allowing God to shape and mold you into a Kingdom treasure with immeasurable beauty and divine usefulness; or are you resisting the Potter’s hands, fighting against the divine design He has lovingly chosen for you since before the creation of time? (Ephesians 1:11-12) Yield to the loving hands at work in your life for the Great Potter knows exactly what He desires for the finished product to look like … Himself! …Selah! Today's Spirit-led is a short pictorial devotional of the eternal truth shared above in today's WOTD. You can view the video devotional by clicking on the title, "Potter and the Clay" - G3 for sharing His power-filled words thru CCM & Praise!